An outdoor pool free Wi-Fi and breakfast are all part of the package for our guests at Best Western El Rancho Motor Inn conveniently located right off I-10. This two-story hotel offers 50 rooms with complimentary Wi-Fi flat-panel cable TVs coffeemakers microwaves and mini-fridges. Non-smoking accommodations are available. In the morning guests wake up to a continental breakfast served on the house. Later they can soak in the Cali sun by the seasonal outdoor pool. 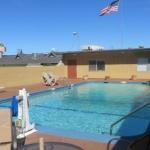 The hotel also offers business services an on-site laundry facility and 24-hour front desk. Parking is free and pets are welcome for an additional fee. Located off I-10 Best Western is within one block of several restaurants and nine miles from Desert Hills Premium Outlets. Gambling and entertainment action at Morongo Casino and Spa is about 10 minutes away. Oak Glen Apple Orchards is about 20 minutes from the hotel and the California Speedway is about 40 minutes. Palm Springs International Airport is 30 miles.